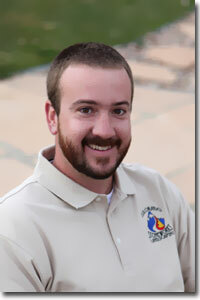 Jonathan is the Maintenance Manager for Colorado Stoneworks Landscaping. Jonathan was born in Kansas City, Missouri and moved to Sioux City, Iowa for a few years. His family came to Colorado Springs when he was in 3rd grade, and he has lived here ever since. Jonathan graduated from Cheyenne Mountain High School in 2001, and spent a semester at Oklahoma Wesleyan University in Bartlesville, OK. Jonathan earned his Landscape Industry Certified Technician certification in Landscape Maintenance in 2012. Jonathan worked for a number of years at the Cliff House at Pikes Peak as a bellman/valet before moving into the landscaping industry. After a few years, with the influence of a friend, he decided it was time to start Colorado Stoneworks Landscaping. Jonathan loves to play soccer, and is active in a competitive men’s league in the spring and fall. He is also quite the pool shark, and competes in the amateur APA league, as well as on his table at home with his wife, Anne, who is also a bit of a shark with a pool cue. He loves doing anything outdoors, enjoying the beautiful Colorado landscape: hiking, biking, skiing, snow shoeing, and fishing. Anne is the Operations Manager for Colorado Stoneworks Landscaping. Anne was born in Rockport, Massachusetts and moved to Colorado Springs when she was 2 years old. She doesn’t remember anything but Colorado, so we think that counts as being a native! She graduated from Cheyenne Mountain High School in 2001, and earned a Bachelor’s in English from Boston University in 2005. 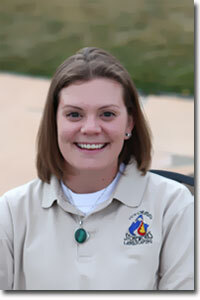 After graduation from BU, she worked with the Girl Scouts of Colorado as a Membership and Outreach Specialist. She truly enjoyed her time at the Girl Scouts, and fully supports their program and goals of building girls’ courage, confidence, and character. Anne joined the Colorado Stoneworks crew during the summer of 2007. She jumped at the opportunity to work for herself at home and to continue to pursue her love of learning. As soon as she joined the company, she enrolled in small business management at Pikes Peak Community College and received an Associate of Applied Science in Business Administration Entrepreneurship in May of 2011. In 2012, she earned the CLP designation through PLANET which is a Landscape Industry Certified Manager. Running a small business was a venture she didn’t see in her future, but she truly enjoys the challenges of entrepreneurship and is looking forward to Stoneworks’ continued success! Jonathan and Anne were married in October of 2007 in Palmer Lake, CO. They have a home in Colorado Springs full of 2 dogs and 3 cats and are happy to announce the birth of Layla Mae Campbell on July 9th, 2011. They spend as much time as possible enjoying the majesty that is Colorado. Hiking, camping, biking, skiing, and snow shoeing are some of their favorite things to do.